Partner the ratatouille with this great savoury rice, that’s scented with saffron and orange. Preheat the oven to 190°C, gas mark 5. Dissolve the stock cube in 900ml boiling water before adding the saffron. 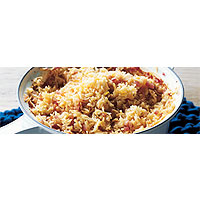 Heat the butter in a flameproof casserole and gently cook the onion for 5 minutes until softened and golden. Add the rice and cook for a further 1 minute, stirring until the grains are coated in the butter. Pour the hot stock into the pan along with the orange zest and juice, then bring to the boil. Cover with a tight-fitting lid and bake in the oven for 25-30 minutes until the liquid has been absorbed and the grains are tender.